The continued recovery of the housing market depends upon demand for products and services from Armstrong World, Lennox, Masco, Owens Corning and Vulcan Materials. Here's how to trade them. Armstrong World (AWI - Get Report) , Lennox International (LII - Get Report) , Masco (MAS - Get Report) , Owens Corning (OC - Get Report) and Vulcan Materials (VMC - Get Report) provide products and materials to all segments of the housing market, including new home construction, home resale and home improvement. These stocks are components of the PHLX Housing Index, which has 19 components, of which 11 are homebuilders. Armstrong World provides ceilings and cabinets. Lennox makes air conditioning and heating systems. Masco offers home improvement and building products. Owens Corning makes insulation, roofing and siding products. Vulcan Materials makes the ingredients for concrete and cement. 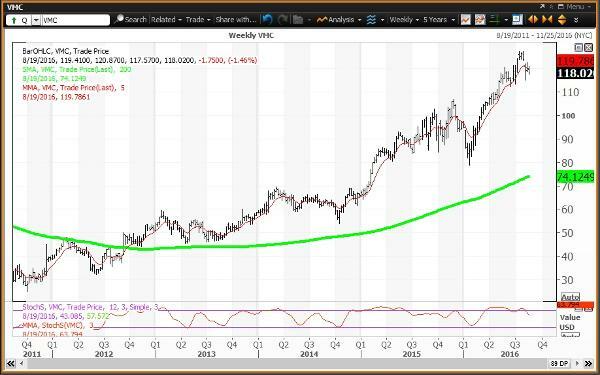 Here's the weekly chart for the housing index. The housing index is positive but overbought, with the index above its key weekly moving average of 244.75 and above its 200-week simple moving average of 207.01. Weekly momentum is projected to slip to 80.94 this week, down from 83.09 on Aug. 12, close to declining below the overbought threshold of 80.00. 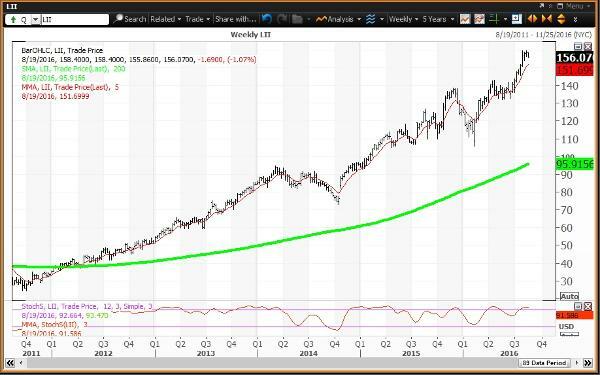 A weekly close below 244.75 will shift the housing index to negative. The horizontal lines are the Fibonacci retracements of the decline from the index's July 2005 high of 293.66 to the March 2009 low of 54.31. The crash of 2008 totaled 81.5%. 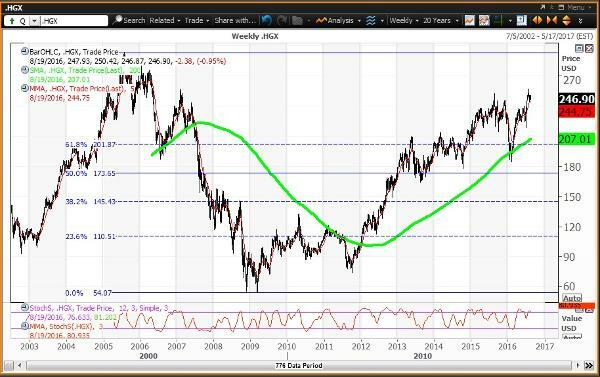 The index has been above its 61.8% retracement at 201.87 since the week of Feb. 26. Here's the scorecard for the housing index and five housing related stocks. Here's the weekly chart for Armstrong World. 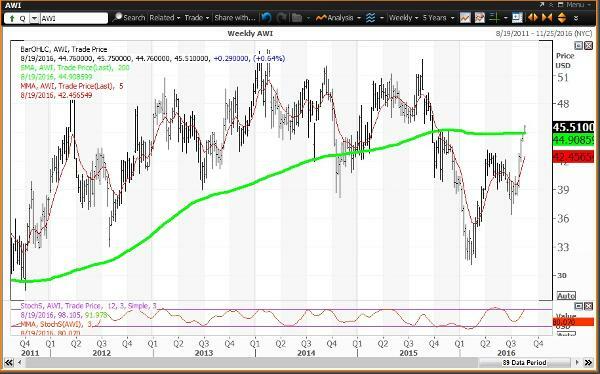 The weekly chart for Armstrong World is positive, with the stock above its key weekly moving average of $44.91 and now above its 200-week simple moving average of $44.91. The weekly momentum reading is projected to rise to 80.07 this week, up from 71.05 on Aug. 12, becoming overbought. Investors looking to buy Armstrong should buy weakness to $36.90, which is a key level on technical charts until the end of September. There are several pivots in play, including annual pivots of $41.95 and $44.84. Investors looking to reduce holdings should sell strength to $50.19, which is a key level on technical charts until the end of 2016. Here's the weekly chart for Lennox. The weekly chart for Lennox is positive but overbought, with the stock above its key weekly moving average of $151.70 and well above its 200-week simple moving average of $95.92. The weekly momentum reading is projected to rise to 91.59 this week, up from 91.05 on Aug. 12, moving further above the overbought threshold of 80.00. Investors looking to buy Lennox should buy weakness to $143.75 and $139.11, which are key levels on technical charts until the end of September and the end of August, respectively. Investors looking to reduce holdings should sell strength to $154.38, which is a key level on technical charts until the end of 2016. This week's risky level is $167.55. Here's the weekly chart for Masco. The weekly chart for Masco is positive but overbought, with the stock above its key weekly moving average of $34.52 and well above its 200-week simple moving average of $22.11. The weekly momentum reading is projected to rise to 83.29 this week, up from 82.74 on Aug. 12. Investors looking to buy Masco should buy weakness to $33.82 and $33.13, which are key levels on technical charts until the end of 2016 and the end of September, respectively. Investors looking to reduce holdings should sell strength to $37.25, which is a key level on technical charts until the end of this week. Here's the weekly chart for Owens Corning. 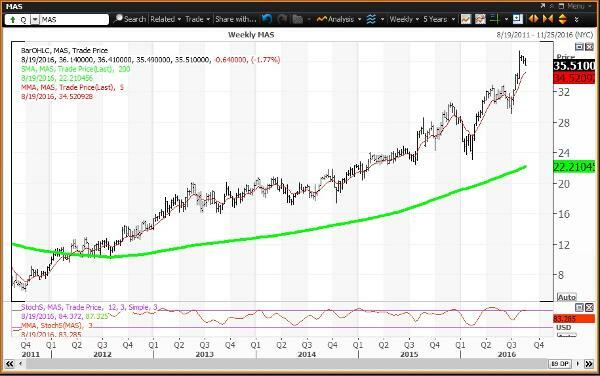 The weekly chart for Owens Corning is neutral, with the stock above its key weekly moving average of $52.98 and well above its 200-week simple moving average of $41.29. The weekly momentum reading is projected to decline to 62.83, down from 68.29 on Aug. 12. Investors looking to buy Owens Corning should buy weakness to $50.47 and $48.76, which are key levels on technical charts until the end of August and the end of 2016, respectively. Investors looking to reduce holdings should sell strength to $56.48, which is a key level on technical charts until the end of 2016. Here's the weekly chart for Vulcan Materials. 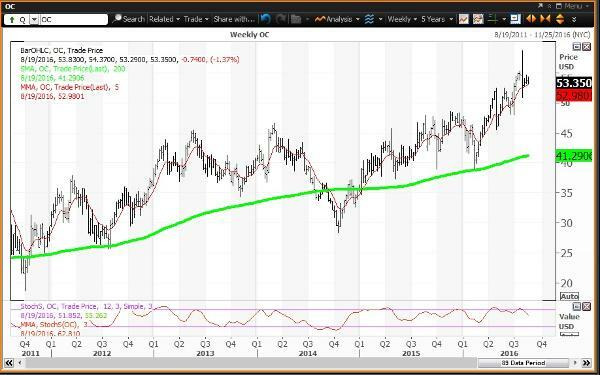 The weekly chart for Vulcan Materials is negative, with the stock below its key weekly moving average of $119.78 and above its 200-week simple moving average of $74.12. The weekly momentum reading is projected to decline to 63.79 this week, down from 74.15 on Aug. 12. Investors looking to buy Vulcan Materials should buy weakness to $117.84 and $115.10, which are key levels on technical charts until the end of 2016 and the end of August, respectively. Investors looking to reduce holdings should sell strength to $119.51, which is a key level on technical charts until the end of September.